This US WOODLAND (M81 Pattern) Infantry Kit includes the Shirt and Pants in Us Woodland (M81 Pattern). It also includes a US Woodland Camouflage PASGT Helmet and a US Woodland Pattern Balaclava (Adaptive System). All items are brand new and available in size S-M-L-XL-XXL. In use by Army, Military, Police and Special International Forces. The US WOODLAND (M81 Pattern) Camouflage Pattern has been introduced by the US Military Forces in 1981. It was progressively established as the standard camouflage for all branches of USA Military (Army/Navy/Air Force/Marines). This Woodland pattern is the result of the evolution of the M1948 ERDL Pattern developed by the US Army in 1948, deployed to Special Forces in Vietnam and issued to United States Marine Corps since 1968. The US WOODLAND (M81 Pattern) is a High-Contrast disruptive pattern with Four-Color asymetrical markings (Brown, Green, Sand & Black) and primarly designed for Woodland & Jungle/Tropical Environments. One of the most replicated camouflage pattern (Variations of this camouflage are in use in multiple National Armies all around the World). Even with the introduction of Specialized Camouflages by the US Military Forces (ACU, MARPAT, ABU, MULTICAM) the US WOODLAND (M81 Pattern) is still currently in use by US Army, Navy, Air Forces and Security Forces. 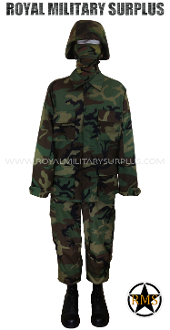 The Canada based Royal Military Surplus online store offers range of quality Military Kits, Combat Uniforms, Tactical Gear and Military Apparel in US WOODLAND (M81 Pattern) Camouflage.